MacKenzie Commercial Real Estate Services, LLC is proud to announce the recent sale of an office condominium at Annapolis’ premier destination center, Annapolis Towne Centre (ATC). 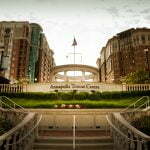 Known as the “Offices at Annapolis Towne Centre,” 1906 Towne Centre Boulevard is a two-story, 46,000 square foot Class A office condominium building situated in the heart of the project. Investment management firm, Scarborough Capital Management, purchased a 5,381 square foot condominium, bringing the building to fully occupied. MacKenzie’s team of Trish Farrell, Chris Bennett, and Scott Wimbrow represented the developer, Greenberg Gibbons, and MacKenzie’s Justin Mullen represented the purchaser. A destination lifestyle center, ATC combines more than 2,000,000 square feet of retail uses with luxury condominiums and apartments and Class A office space. Anchored by Whole Foods and Target, the center offers visitors and office tenants premier retail offerings and first-quality restaurants. “The Annapolis Towne Centre was a natural fit for our firm as we continue to grow our practice,” stated Gregory Ostrowski, Managing Partner of Scarborough. “For over 25 years, we’ve worked with thousands of individual investors across the country, managing 401k and IRA assets and helping plan for a comfortable retirement. We strive to deliver a client experience combining technology with a fresh, approachable perspective to retirement planning. Our primary goal is to help clients gain enhanced visibility when making investment decisions and we’re excited that our new space at ATC is specifically designed to support these efforts,” added Ostrowski. Scarborough joins office tenants Hannon Armstrong, RBC Wealth Management, and Wells Fargo. Additional office space is available for lease at 1910 Towne Centre Boulevard, an 11,877 square foot space that was once home to Smyth Jewelers. The space is ideal for both office and retail uses and can be divided. “The available space is located on a premier corner of the center offering high visibility, an amazing window line, and unparalleled amenities for employees, affording the live, work, play lifestyle,” said Trish Farrell. For more information on Scarborough Capital Management, please visit www.scmadvice.com. For leasing inquiries, visit www.mackenziecommercial.com, or contact Trish Farrell at 410.974.9003, tfarrell@mackenziecommercial.com, or Justin Mullen at 410.974.9008, jmullen@mackenziecommercial.com.